Hayes is a suburban development in the London Borough of Hillingdon, West London, situated 13 miles from Charing Cross. Beginning as a light industrial engineering locality in the late nineteenth century, the town developed as housing was built for the many factory workers. The town is best known as the former home of EMI music publishing. “Hayes” is printed on the reverse of the Beatles albums, as they were manufactured at the town’s old Vinyl Factory. Hayes is also the location of the UK headquarters of companies such as Heinz, Fujitsu and much more, a town with a clear history of good inventory management and third party logistics (3PL). If you are looking for a warehouse for rent within Greater London, Hayes is perfect, located within 15 minutes of both the M4 (junctions 3 and 4) and the M25 (junction 15) for easy access to routes in and out of London. Hayes offers excellent transport links across southern England into the South Wales and other areas of the UK. The main North-South route is the A312, while the A4020 passes straight through Hayes West-East. Given how easily accessible the area is, its close proximity to Central London and the great links to the rest of the UK, warehousing in Hayes is highly sought after. You can find empty Hayes warehousing, together with manned warehouses which can assist with all of your warehousing requirements, here on our Website via our online directory. We can help you refine your search ensuring you choose the right warehouse to suit your businesses needs. 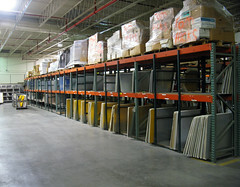 We successfully match manufacturers and suppliers with warehouse space providers daily. Warehouse services range from Hayes pick and pack services, pallet storage services, order fulfilment services, bulk storage services, through to national or international distribution, stock control, CCTV, waste disposal and much more. If your goods are palletised (cannot be stacked) and the pallets are below a certain height, then they will normally fit in pallet racking if the warehouse has this available. Racking unstackable pallets is the solution to ensure that not too much floor space is not taken up, resulting in less cost of a warehouse space for the customer. Current 3PL providers in the area offer both bulk storage for stackable pallets or bulky items, with many having areas of racked storage for the pallets which cannot be stacked and are usually no higher than 1.6 metres. To find a Hayes storage warehouse, and a variety of different warehouse services, we have a host of providers available to contact. Simply click on the more info buttons below, for full facility and contact details. Please remember to quote “Whichwarehouse” when speaking to them. Alternatively call a member of our team to assist, negotiate and organise for you, on 0800 1707 555. With a large network of warehouse spaces and successful third party logistics services, we provide the opportunity for you to complete your supply chain. Alternatively if you’re a warehouse provider (owner/landlord) looking to advertise warehouse space in your area, we can promote your warehousing facilities and any services available. We help match manufacturers and suppliers who are looking for warehouse space to find the right location and amenities for their business.